We at the Beverly Hills Periodontics and Dental Implant Center are a state of the art facility specializing in the fields of periodontics and dental implantology. 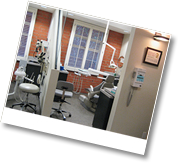 Our office offers a variety of technology that’s very unique to a periodontal specialty office. For example, digital radiography provides immediate and accurate imaging when preparing for periodontal and dental implants. Our high powered microscopes assist in providing excellent results in periodontal plastic surgery and aesthetic crown lengthening cases. In particular, our 3D-CT Scan imaging makes our dental office very unique amongst our peers by allowing us to place implants with CADCAM (computer assisted) imaging. This CT Scan imaging not only provides us with the most accurate image of the anatomy possible, but also allows us to confirm teeth fractures that are otherwise hard to diagnose. The use of innovative technology allows us to accurately diagnose and successfully treat everything from mild to severe cases, all the while avoiding unnecessary treatments and costs to our patients. In addition to conventional periodontal therapy, our office offers safe and effective laser surgery for cases that warrant such treatment. Successful results for our patients is our #1 priority, which why we only place prestigious dental implant brands such as Biomet 3I and Noble Biocare. With the advent of today’s technology, we are now capable of treating many different cases via replacement of poor prognosis teeth with immediate implants. One can have a tooth replacement without having to worry about wearing something removable. Whether you are a patient or a referring doctor, we proudly welcome you to our facility. • Digital radiographs, which have much less radiation than conventional radiographs and make your dental implant experience much more convenient overall. • The 3D-CT Scan, which allows us to see a 3 – Dimensional image of the anatomy that’s extremely accurate. Thus it allows us to perfectly prepare for amount and places for bone augmentation. It even allows us to utilize CADCAM computer imaging for placement of implants. Many medical professionals view the CADCAM as the pinnacle of technology for dental implant placement. • Laser Therapy, which allows us to provide the best, easiest quality of care where it may be preferred over conventional periodontal surgical treatment.